Viejas Arena opened in 1997. The arena is built on the Aztec Bowl. The arena holds 12,414 fans. 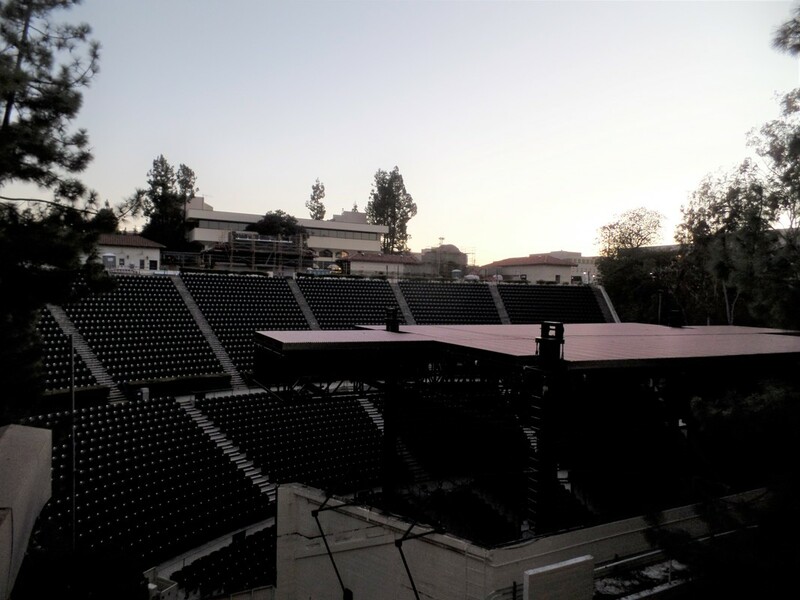 Outside of Aztec basketball the arena hold many concerts and events. Seating at Viejas Arena is pretty simple. The Bowl consists of red chairback seats outside of the top 6 rows. The top 6 rows are bench style seats. Each section has 36 rows. At the top of the seating bowl they have seating options for wheelchairs. The band and student section are located in M,L,K. There are a total of 2,500 seats for the student and band sections. 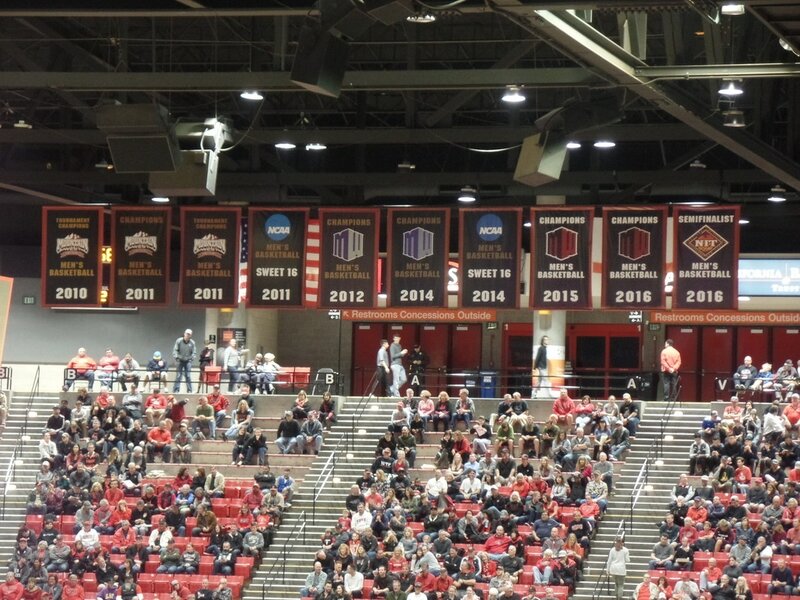 The arena features a lot of banners at the top of the building, ranging from MWC titles to NCAA appearances. In 2009 the arena got a new scoreboard. The scoreboard hangs 26 ft high and 15 ft wide. It has four boards and a center videoboard ring at the bottom. The new scoreboard cost 1.2 million dollars. At the top of the board is Viejas Arena. The arena features two concourses. One is inside and the other is outside. The one inside has a few concession stand options. Outside you have tables to sit at, food trucks, regular concession stands and more. The restrooms are also located outside. The exterior of the arena plays to the rest of the campus design. You will see gates surrounding the arena since they have a concourse there. 1. First things first head to Hash House A Go Go. The Chicken and Waffles is enough for two! 2. Take a walk through the Gas Lamp Quarter downtown. Plenty of places to eat/drink. PetCo Park is nearby too. 3. Head across the way to Coronado. 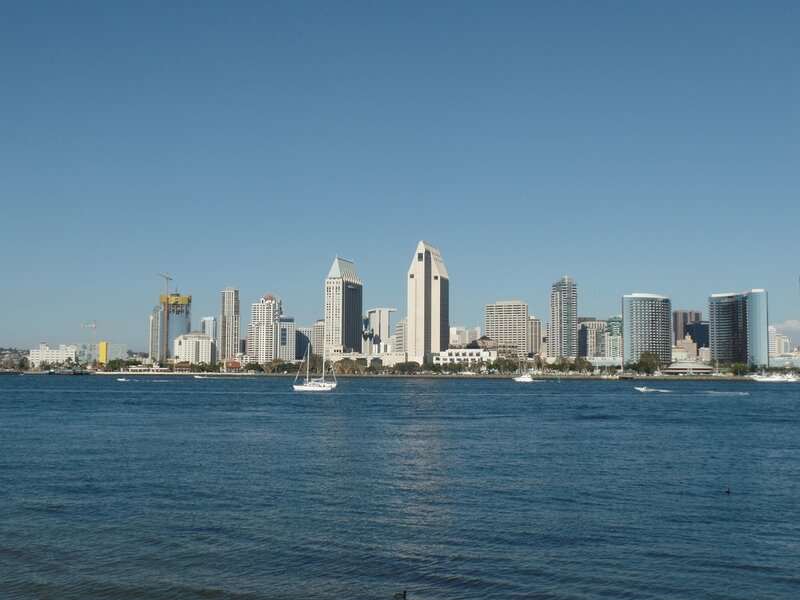 You can get a great picture of San Diego. 4. If you have time before the game check out La Jolla. 5. 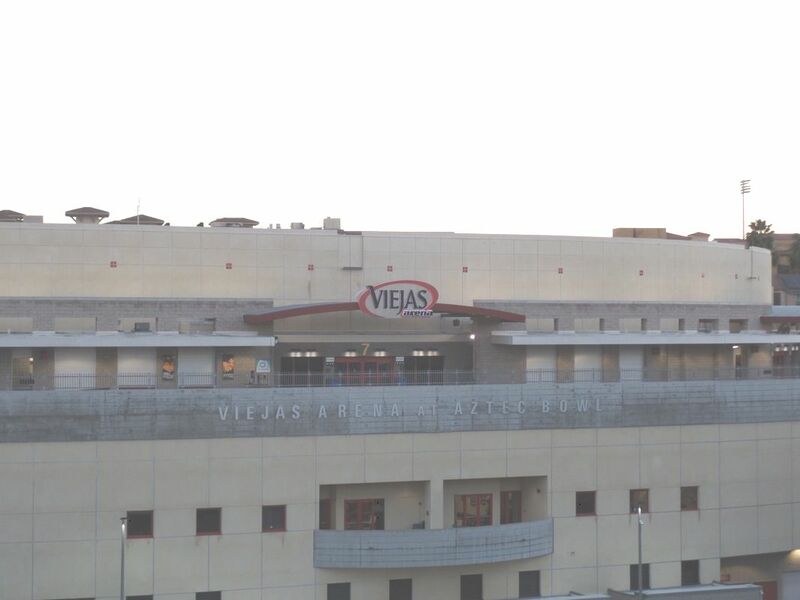 Head to Viejas Arena, they have a parking garage nearby! Viejas Arena: Not a bad seat in the house. For a venue that sits over 12,000 fans the seating bowl puts the observer in great seats. I have never been to an arena where the outside is the primary concourse. It screams San Diego and I love that. The local food vendors are a great touch too. Being built on the site of the Aztec Bowl and keeping some of its features outside is a nice touch. Overall this venue gets a big thumbs up from me. Upgrades: Nothing too major here. I don't mind having the non chairback seats at the top. The NCAA once required 12,000 seats to host tournament games so if they ever go back to that you don't want to change those seats. The small issues I have with the arena are the grey boards on the walls of the indoor concourse. There are many better options that are not so bland to put on the walls. The concession areas could be upgraded slightly to bring in a new feel to the venue. The ads above the entrance could be upgraded by changing them to LED scoreboards with ads. 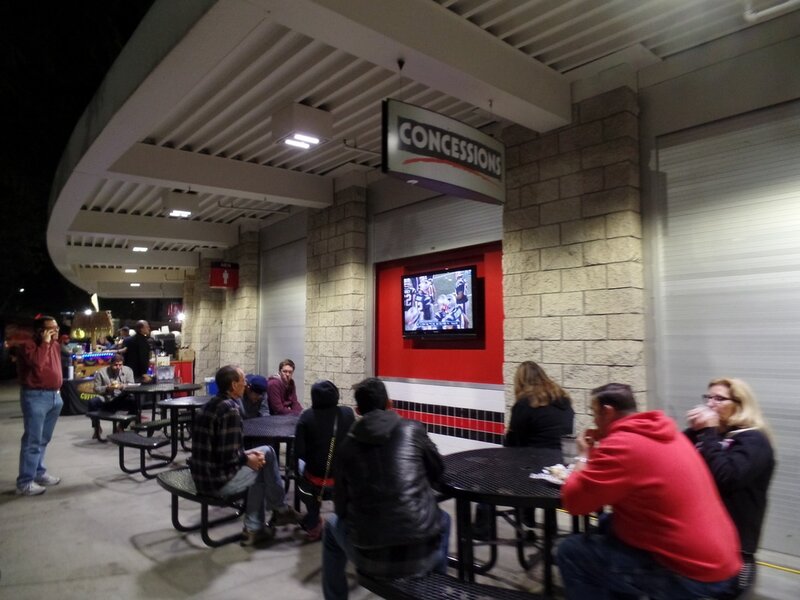 Continue to add more seating areas with different styles around the outdoor concourse. Maybe an area for kids to play. (I could have missed this). Overall nothing major to change but the slight changes would make it even better. 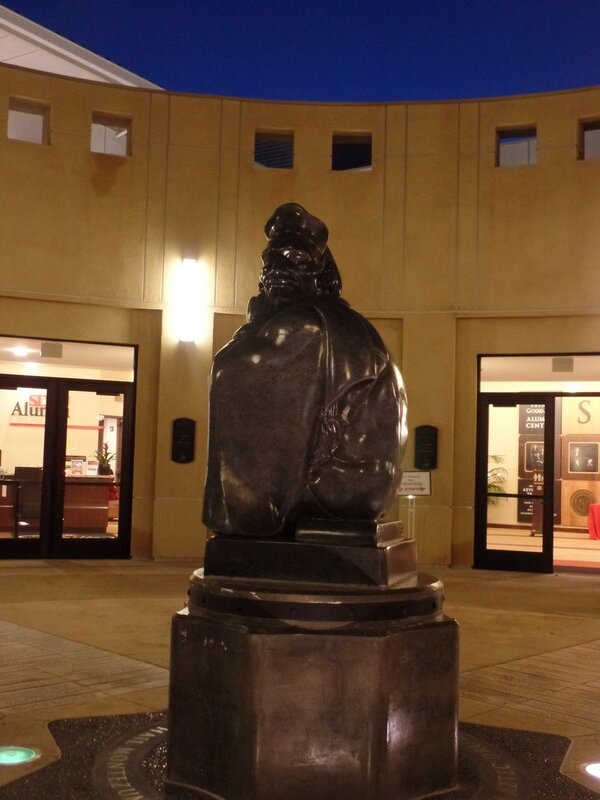 San Diego State Campus: San Diego State has been around since 1897. 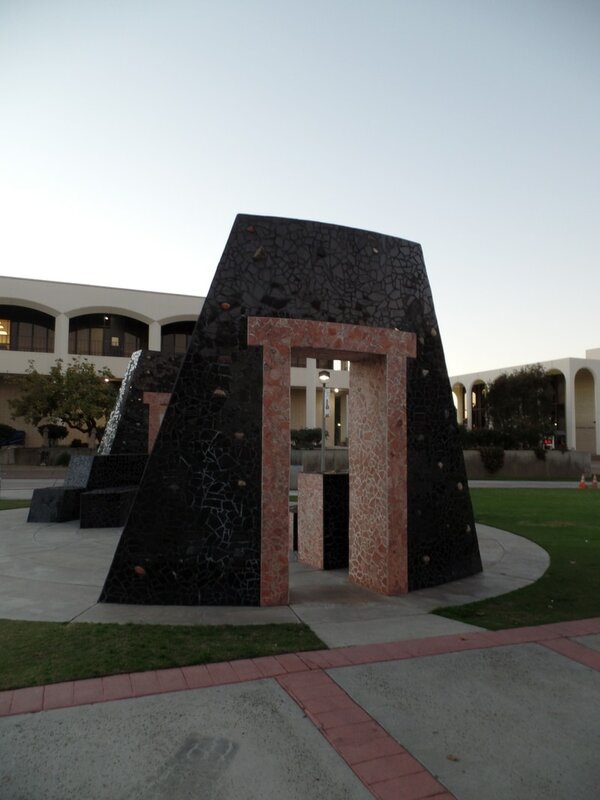 In 1974 after many name changes they became San Diego State University. The school sits on 10 acres east of downtown San Diego. The school currently has around 35,000 students. San Diego State's campus aka "Montezuma Mesa" has a Mission Revival style. The campus has many buildings/areas that you need to see on campus. 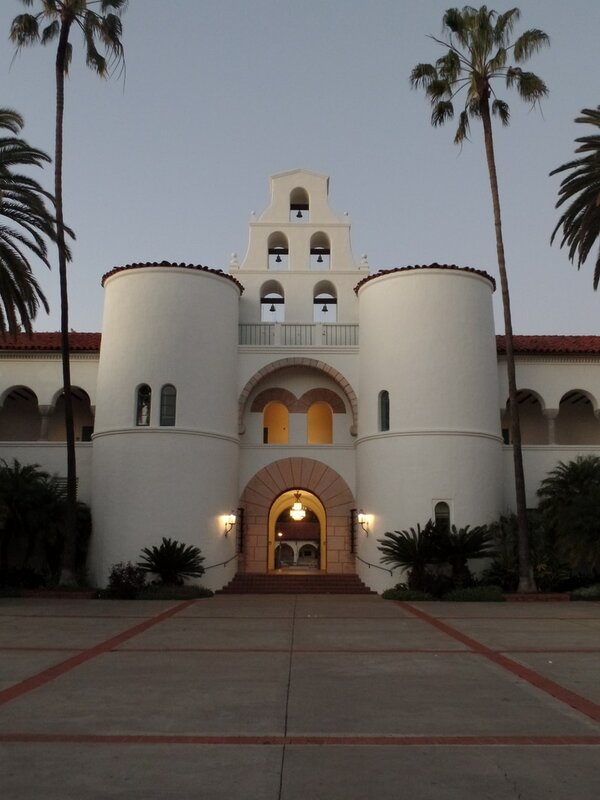 One of my favorite buildings is Hepner Hall which really shows off the campus architectural style. The outdoor theater is really something to see if you are from the Midwest like I am. The theater holds around 4,500. You may see the library as you walk around and the info dome. A large majority of the athletic facilities are located on the west side of campus. This is also where you can find the SDSU Athletics Hall of Fame. One unique feature which I have mentioned already once is the fact that the Aztec Bowl is still semi-standing where Viejas Arena is. If you are looking for a nice campus to walk around in good weather 90 percent of the time give SDSU a walk. Scoreboard: The center hung scoreboard is great. No matter how old your venue may be adding a modern scoreboard brings new life to a building. Overall it is a good size for the venue. As mentioned above some LED banner scoreboards for more stats plus ads would be a nice touch. 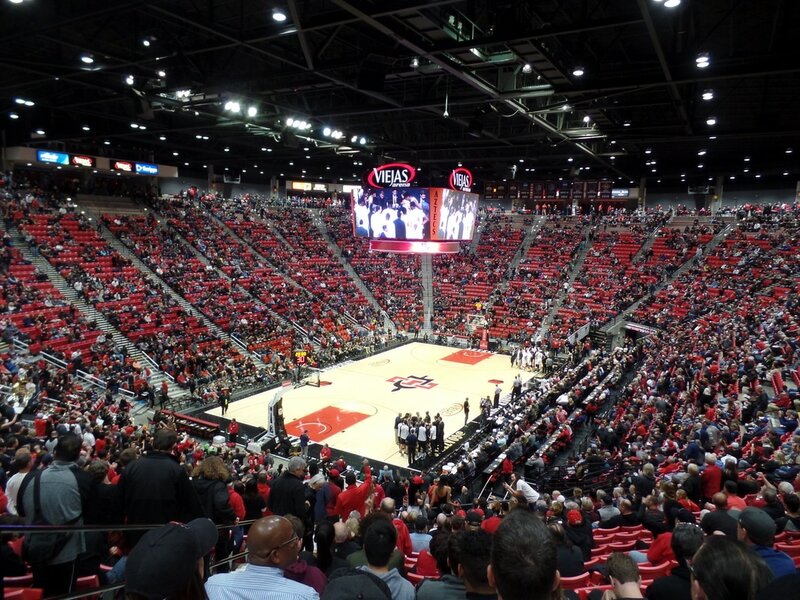 Atmosphere: San Diego State has gained a reputation for having sold out arenas. (They finally broke the streak a game after I left) "The Show" wasn't in full force when I was there since the students were on break but they went on as if it was a full student section. I know the student section performs at a high level and so do the fans. This game was packed despite the down year that SDSU was having and facing a Utah State team that was below average for their standards. 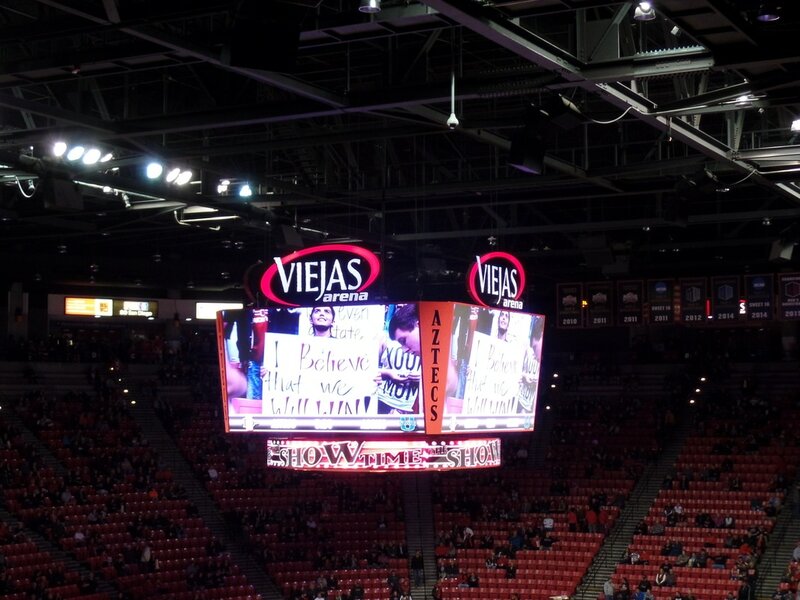 I encourage fans to keep going to games and making Viejas Arena one of the tougher places to play in the country. San Diego, CA: If you haven't made a trip to San Diego, what are you waiting for. This city has it all. Great food, entertainment, and weather. Great weather. I went in January, locals said it was a bad few days for SD. I was in shorts and a t-shirt. So that should be all you need to know about the weather. Two areas known for their food Little Italy and Gas Lamp. Gas Lamp has a ton of options for you. The place that we went to and had recommendations towards was Barleymash. Lots of beer options on the menu and a diverse options for brunch or dinner. Petco Park is nearby for people that enjoy seeing ballparks. One place we did stop for brunch was Hash House A Go Go. All I will say is the Chicken and Waffles was enough for three people, amazing. Also, order the homemade lemonade. This is a good place to stop at before heading to one of San Diego's top attractions, the San Diego Zoo. A visit to the zoo does come at a high price tag but it is the best zoo in America according to a majority of publications. If you get a chance to check out the town of La Jolla, do it. This is your spot for ocean bluffs and beaches. La Jolla Shores is a large beach with a pier. LA Jolla Cove is a popular destination. The Cove provides great views and sometimes you will find sea lions basking in the sun on the rocks. This is near the downtown portion of La Jolla. Parking comes at a premium here, good luck. Since you are so close by check out Torrey Pines. If you are a big golf fan you can go to the course to visit or to play. The course is city owned so not private membership needed. You may see a lot of paragliding and hang gliders in the area. You can do that at Torrey Pines Flight School for around 175-225 dollars. Where Does Viejas Arena Rank? Check out our full rankings or our College Basketball Arena Rankings.